Mission San Jose de Tumacacori was founded by Father Esuebio Kino in 1691. It is the first missions established in what was to become Southern Arizona. San Jose Mission pre-dates the larger and more grand San Xavier Mission de Bac near Tucson. Father Kino founded the San Xavier Mission one year later. Spanish missions expanded the economic structure of Spain. Built near existing Indian communities, they became a central gathering point. Priests worked to convert the Indians to the Catholic religion. Once converted, the natives would make contributions to the church. Their contributions were revenue for the Spainish throne. The Spanish mission system had two types of facilities. Large missions were identified as “cabecera” missions. Built in populated, they were home to the Priests serving the church. Smaller facilities were called “visitas”. And built in less populated areas. No one lived in them. Priests would regularly travel from the “cabecera missions” to the “visitas”. They would work with the locals and hold services. Unfortunately, the Spanish colonization had a devastating effect on the native peoples. With the priests and soldiers came diseases. It is estimated that measles and small pox killed almost 60 percent of the native population. Apache Indians shortened the longevity of many missions in southern Arizona. In 1848, Apache raids along with the harsh winter drove people away. The San Jose Mission was abandon. Without military protection, the Pima and Papago Indians fled the area. Priests from the San Xavier Mission stopped visiting. It was 7 years before they returned. As the last Indians fled, religious items were moved to the San Xavier Mission. Many of these religious objects are still there. 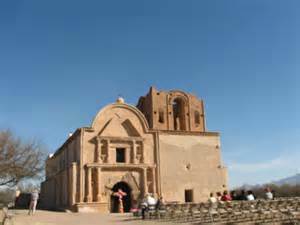 Mission San Jose is located in the Tumacacori National Historic Park. The park is about 45 miles south of Tucson, AZ at exit 29 on Highway I-19. It is about 10 miles north of the Mexican border. The Tumacacori National Historic Park has three Spanish mission sites. Calabasas, Guevavi, and Tumacacori. National park status protects the ruins and remaining artifacts. Tumacacori NHP area is one of the oldest outposts of European civilization in America. Mission San José church is a popular tourist destination. The mission church building remains in a state of “arrested ruin”. The goal is to preserve the original structure rather than restore it. If your are looking for a great day trip, visiting Mission San Jose is perfect. You may also want to take in Tubac. Located along I-19 just south of Green Valley. Tubac dates back to 1752. It housed the original Spanish colonial garrison in Arizona. Today, it is known for its numerous art and craft stores and unique restaurants. And if you think Tucson AZ might just be the place for your future home, we can help. We are a Top Realtor team in Tucson. We will work with you to find your “perfect” home in Tucson.